More than 600 students gathered at Shaftesbury High School Tuesday to hear from a Holocaust survivor who was invited to share his personal story after anti-Semitic messages were directed via social media at one student by other Shaftesbury students over the summer. 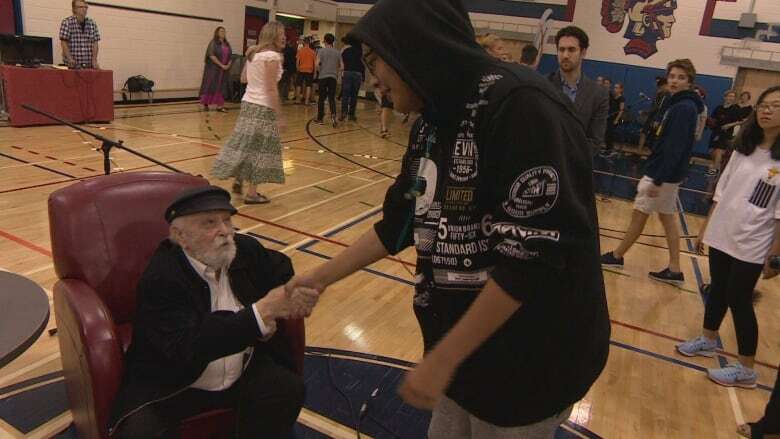 More than 600 students gathered at Shaftesbury High School Tuesday to hear from a Holocaust survivor who was invited to share his personal story after anti-Semitic messages were directed at one student by other Shaftesbury students over the summer. 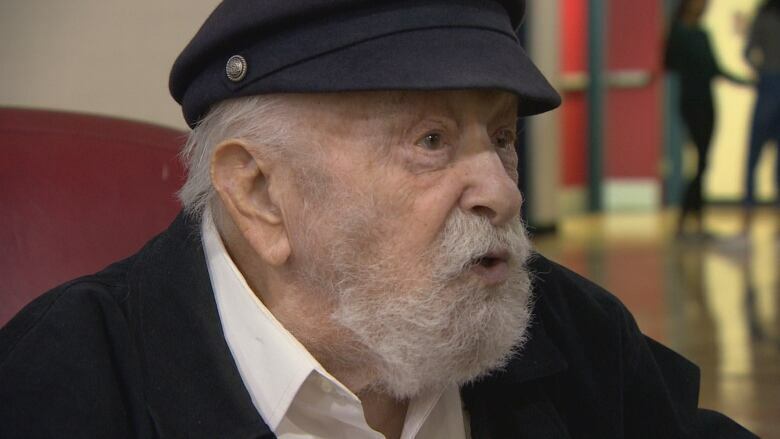 Cantor Moshe Kraus, 95, lives in Ottawa. He made the trip to Winnipeg with his wife, Rivka, to teach students about hate and anti-Semitism. Kraus survived two concentration camps, including the Bergen-Belsen camp in Germany, where he told students thousands of Jews were killed every day. He lost many members of his family there. "My father was 42, my mother was 38 — two sisters, seven- and six-years-old, 32 uncles and aunties burned," he said. "One hundred and forty of their children burned and I have a question, " Kraus said, fighting back tears. "Why did I remain alive?" He was 20 years old when he arrived at the Nazi concentration camp. On Tuesday, he recalled painful memories about the horrific conditions he lived in, and how he was starved and tortured by being suspended with his hands bound behind his back for hours. "It was very painful but I didn't cry," he said, because he didn't want to give the Nazis the joy of seeing him in pain. "I was there 11 months. I don't want to tell stories from Bergen-Belsen and make you sad, but I came here to show people a person from the Holocaust," Kraus said. Kraus was a cantor before the Second World War. He began singing in concerts and Shabbat services when he was nine years old. He believes he's only alive today because he was forced to sing every Sunday for Josef Kramer, the commandant of the camp at the time, and later known as a notorious Nazi war criminal responsible for the deaths of thousands of Jews. "There are people that will say there was no Holocaust, but there was," Kraus said in front of 670 students, parents and teachers who packed the school gym Tuesday morning. Kraus told students that they should remember him if they ever encounter someone who denies the Holocaust happened. B'nai Brith Canada helped set up the meeting with Kraus after Winnipeg police were called last week to investigate hate incidents. A Shaftesbury student was targeted with anti-Semitic images sent by other students over the summer. It's not clear what images were shared, but some included a swatiska. The Pembina Trails School Division said all students and families involved in the incident have agreed to talk and work out their issues. No criminal charges have been laid in the incident. Ran Ukashi, B'nai Brith regional director for Manitoba, hopes the meeting with Kraus and students makes a difference. "Any time you hear an incident like that taking place, it's upsetting and I feel worse for the person on the receiving end of it more than anything, but as well it's an opportunity to educate those who might harbour anti-Semitic views," Ukashi said. Grade 12 student Andrea Warzel said she learned a lot from hearing Kraus speak. "You read the books, you see the movies, but you never get the details from a first-hand experience, so it's always interesting and eye-opening to hear the personal details," Warzel said. "It's important because the Holocaust for us, the youth, was so long ago and we tend to forget that these things still happen and there's still hate in the world," she said. Grade 11 student Natan Skladnik said he's heard stories from Holocaust survivors before but not in person. "The stories are all special in their own way," he said. "But it's just different reading it from a textbook and sort of hearing it from a person who actually experienced it," Skladnik said. When asked about the recent spate of hate related incidents happening across the country, Kraus said there are "good and bad people in the world." He said young people need to be reminded that the Holocaust could happen again. "There are very good Canadians and very bad Canadians, there are very good Americans and very bad Americans, there are very good Jews and very bad Jews, and there are very good Germans and very bad Germans," he said. "It is very important for them to learn that there should not be something like that again, but I don't know if that will help. "If there comes a Hitler and he has the talent to make people hate people, it can happen everywhere. It can happen again."